Cornering ABS and trick suspension highlight the refreshed Aprilias. 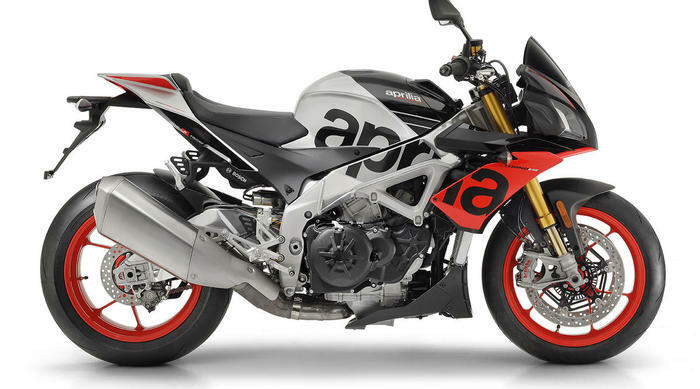 Topline: Aprilia’s super naked bikes powered by a 175 hrosepower V-4 engine get a slight makeover for 2019 improving both performance and comfort while adding bold new graphics. What’s New: The updates for the 2019 Aprilia Tuono V4 1100 bikes are mostly technological. One of the most notable new features is its cornering anti-lock brake system developed in partnership with Bosch (sound familiar?) which is now standard on both variants. The cornering ABS on the Aprilias has three levels of sensitivity which can be combined with any of the bikes three engine maps—Sport, Track, and Race. Other new tech for these bikes includes traction control with eight settings, wheelie control, launch control, an electronic quick shift system which allows for clutchless downshifting, a pit limiter which allows you to limit your top speed (why you’d want to on these bikes, we’re not sure), and cruise control. For 2019, the Tuono V4 1100 RR is available in Sachsenring red and Magny-Cours grey. 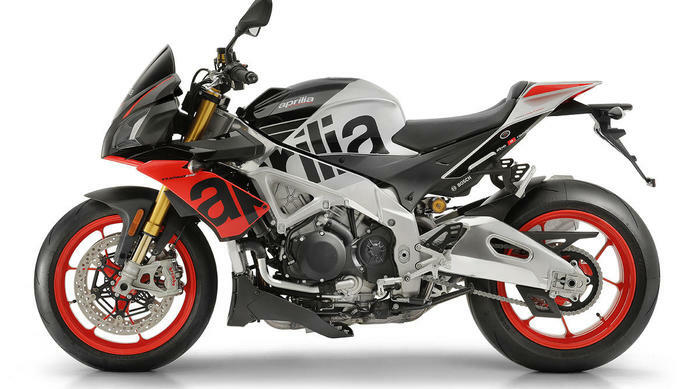 Upgrading to the Factory model will give you the black and red Superpole graphic with bold “Aprilia” lettering that won’t make anyone wonder who made your bike. 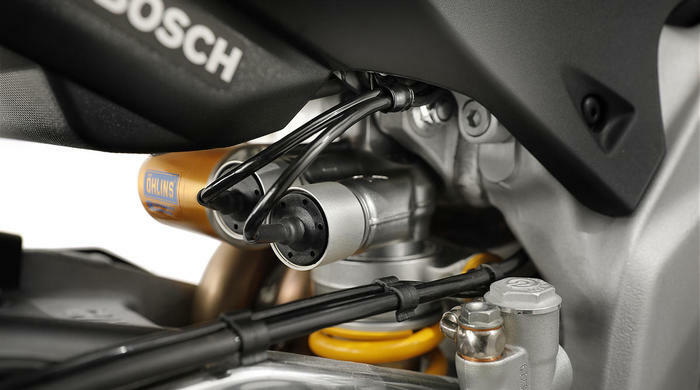 One of the main differences between the higher-volume RR model and the more exclusive Factory variant is electronic Öhlins suspension on the Tuono V4 1100 Factory. It’s super customizable with semi-active and manual operating modes, and Track, Sport, and Road riding modes. You can customize your ride exactly the way you want it combined with the three engine maps, eight traction control modes, and the three sensitivity levels of the bike’s cornering ABS. This is the high-performance naked bike for the very picky rider who wants control of everything the bike is doing. Quotable: “Tuono V4 1100 RR represents an exceptional thrill machine, the heir to a dynasty of naked sport bikes acclaimed by critics as the most effective and fastest bike in its segment. Tuono V4 1100 Factory is the more exclusive version, dedicated to an extremely demanding public, this bike is equipped with components which are largely derived from the Aprilia RSV4 RF superbike. The new Factory now comes standard with the most advanced semi-active electronic suspension system currently available on the market, developed by Öhlins and fine tuned with the collaboration of Aprilia engineers. 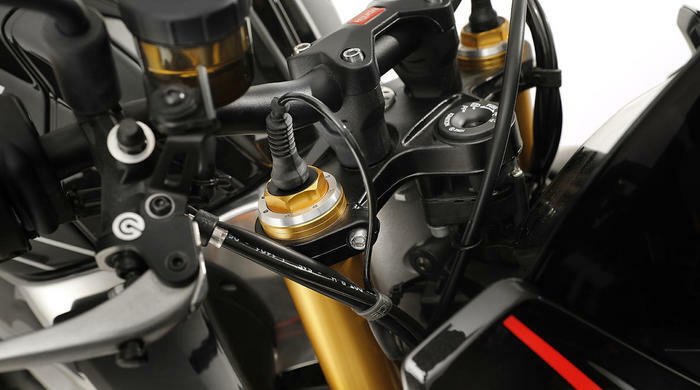 Maximum ease of calibration for the suspension through simple handlebar controls to give you an even more thrilling riding experience in any area of use,” said Aprilia in a press release. What You Need to Know: Aprilia often plays second fiddle to Ducati when it comes to high-end Italian sport bikes, but the Tuono bikes aren’t quite like anything Ducati currently offers. There’s the Ducati Panigale V4, but that’s more of a flat-out sport bike while the Aprilia Tuono is more of an upright naked bike. Yes, it has a lot of plastic on it for being a “naked” bike, but it has a decidedly more neutral riding position than something like an RSV4. Its ergonomics are kind of like the Ducati Monster’s, but the Monster is a different animal with fewer cylinders and a very different aesthetic that looks more like the Aprilia Shiver 900. Naked bikes have been popular for a couple decades now for their sport bike performance without the sport bike discomfort. These Aprilias deliver exactly that experience, but now with added tech to make it a more pleasurable ride at any speed. Aprilia Racers Days for street riders at American tracks connect its racing legacy in the premier classes of MotoGP and World Superbike.